Bob Iger’s path to collect one of the largest hauls of his career just got trickier -- and more lucrative. Walt Disney Co.’s (DIS.N) board firmed up the stock-return goals the company must exceed for Iger to receive a massive block of shares, an opportunity that was part of his contract extension in December 2017, according to a regulatory filing Monday. But the board also sweetened the deal by increasing the chief executive officer’s potential payout. 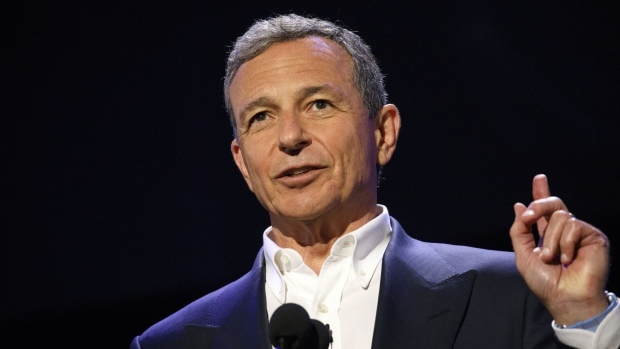 Under the new terms, Iger can earn a maximum of 1.17 million shares if Disney’s stock return beats at least 75 per cent of the companies in the S&P 500 Index over the four years ended Dec. 31, 2021. As of Friday’s close, that potential payout was worth US$135.4 million -- a figure that may increase if the ambitious goal is actually met. That potential haul is 14 per cent bigger than under the initial agreement struck a year ago when Disney announced a deal to acquire assets from 21st Century Fox Inc.
Iger, 67, has doubled revenue and quadrupled Disney’s share price since taking over as CEO in 2005. Still, the goals in his amended contract are ambitious. In the four years ended Nov. 30, the company’s stock returned 33 per cent, including reinvested dividends. That beats about 42 per cent of firms in the index. Iger has other earnings opportunities. As part of the extension, he also got 254,098 shares that he’ll receive as long as he remains CEO through 2021. He’s entitled to collect a bonus and equity award -- subject to performance goals -- worth US$45 million annually for the remainder of his tenure. That’s on top of a US$3.5 million salary. And he’s still got a shot at earning as much as US$60 million in cash under a bonus plan put in place in 2014.